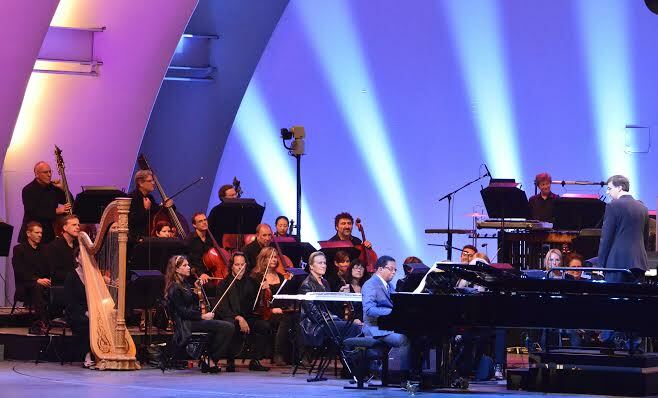 There was a strikingly diversified array of jazz at the Hollywood Bowl Wednesday night – a program signifying the L.A. Phil’s desire to present America’s improvisational music in its many varied manifestations, all of them intriguing in one way or another. Appropriately the headline act was veteran pianist/composer Herbie Hancock, who has also been the Philharmonic’s Creative Chair for Jazz since 2010. In a career reaching back to the early ’60s, Hancock has demonstrated a creative versatility reaching across a complete range of musical expressiveness. And he did so at the Bowl on Wednesday, as well. A trio program by Hancock, Genus and Colaiuta alone would have provided a memorable evening of jazz at its finest. But there was much more, in the form of a full orchestra and the arrangements (and conducting) of Vince Mendoza, whose orchestrating credits reach from Sting to Joni Mitchell. The results were extraordinary, with the combination of Hancock’s arching melodies and lush harmonies with Mendoza’s masterful orchestrations recalling a much earlier musical partnership: the compelling Maurice Ravel orchestrations for Mussorgsky’s Pictures at an Exhibition with orchestrations by Maurice Ravel. 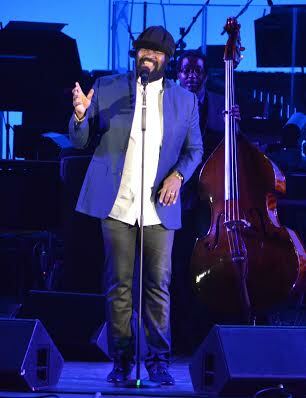 Singer Gregory Porter added a different touch to this musically diverse evening. Establishing himself as a major jazz vocal artist in a few short years, with a Grammy nomination for his first album, Water. in 2010, Porter has been gathering a dedicated audience ever since. Not only is Porter blessed with a lush baritone voice, he also seems to have an intuitive gift for phrasing and a laid-back sense of swing. Add to that the fact that he is one of the jazz world’s few singer/songwriters. And, although most of the originals he sang were unfamiliar, some had the catchy hooks and repetitive choruses that help listeners stay in touch with a song. By the time he finished his brief set, strongly aided by the stunning alto saxophone work of Yosuke Sato, the reasons for Porter’s rapidly growing popularity had become eminently clear. The remaining act on the list of performers in the program was pianist Robert Glasper and the group he calls his “Experiment.” The title alone underscores Glasper’s apparent desire to remain on the cutting edge, envelope stretching areas of contemporary jazz. Some of Glasper’s pieces harkened back to the avant-garde free improvising of the ’60s, especially when saxophonist/vocorder player Casey Benjamin was playing alto saxophone. Scouring his instrument for every sound it could make, he reached from multi-phonics to screeching high harmonics, low honks and busy fingered flurries. 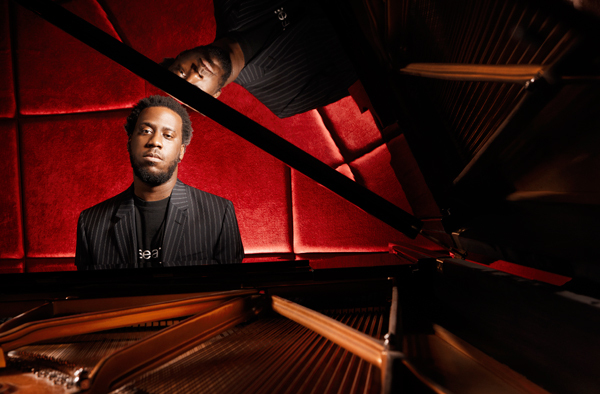 Glasper also tossed in varied linkages with contemporary pop, rock and hip-hop, most of it ending up as a busy smorgasbord of sound that did little to please one’s appetite for jazz in the traditional sense. But give Glasper credit for a desire to add more to the mainstream menu. As I noted earlier, it was an evening of jazz in many different hues. And the Philharmonic should be praised for providing a broad palette of so many musical colors. Herbie Hancock and Gregory Porter Photos by Faith Frenz.